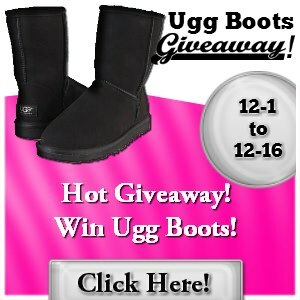 Andrea's World Reviews: UGG'S GIVEAWAY! Welcome to the UGG’s Giveaway! Special thanks to our lovely hosts: It’s Free at Last, Mom Does Reviews,Giveaway Maven, Another Cent Saved, and Mommy’s Coupon Train UGGs are one of the most asked for Christmas presents this year! I know they are right at the top of my list. Here is your chance to win a pair! Giveaway is open to US only. Giveaway ends 12/16/12 at 11:59pm ET Disclosure: Andrea's World is not responsible for prize fulfillment. Share with everyone you care about. I know they will all love the chance to win as well. Good luck. i would want brown boots! i would like the chestnut ones!